To cap off a successful event on June 22, including an afternoon stand-still concert by Blue Stars at the Holland Performing Arts Center, home of the Omaha Symphony Orchestra, the Omaha Summer Music Games DCI event had a visit from Nebraska Governor Dave Heineman and his wife Sally Ganem. 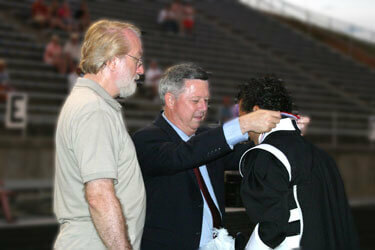 Governor Heineman assisted in presenting awards, including a gold medal to the Cavaliers who won the event. Nebraska Governor Dave Heineman presents a gold medal to Cavaliers' guard sergeant Mark Laydon. "Governor Heineman and his wife are both strong supporters of education and they showed that by coming to this event," said Mark Cline, Tour Event Partner for the Omaha Summer Music Games. "People of this stature help us strengthen what we project in putting on our event. This is a big deal, and when you have these kinds of things recognized at this level, it only helps make the event better for the participants and for the fans. In order to attend the event, Cline said that Governor Heineman rearranged his daily schedule in order to squeeze the appearance in between two other evening commitments.